You get just one day to live out all your fantasies. And 'Baroque' is a true fantasy gown. She's got it all. From her perfect sweet-heart neckline to frame your first kiss, her lightly hand-beaded upper bustline and smooth panel-shaped bodice. From there it's onto the dream princess skirt. 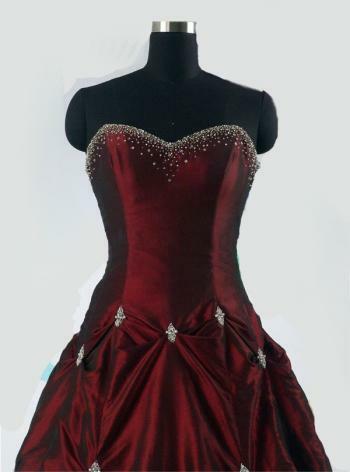 A full ballgown skirt with heart-stoppingly perfect pickups. From behind, you'll leave them gasping at your chapel length train and beautiful wide corset style lace-up back. Please note - having the dress made without a train at all is as easy as letting Bella know when you place your order! 'Baroque' is made of bridal grade taffeta in any colour you wish. While we love the scarlet red, she is also stunning in white and ivory if you wish to be more traditional. Our excellent workmanship means you will be a stand-out bride of the season! 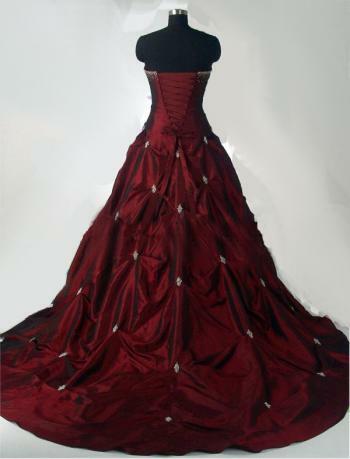 To achieve the fullness shown in the pictures, we recommend purchasing a crinoline (either hoop or tulle). 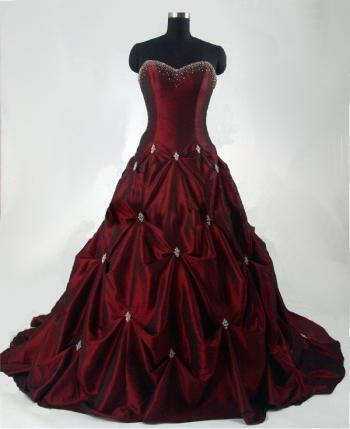 We have these available at fantastic prices and will combine them with your gown package for no additional shipping costs. 3). Relax while Bella and the seamstress prepare the dress to your exact measurements. Depending on the level of detail on the dress, this will take between 8 and 10 weeks. Bella is available at all times via email and will be in touch during the process to let you know how your dress is coming along!